Uhhh can we acknowledge how insane it is that it’s already 2019?? Because I am having *anxiety* about it. Remember when 2020 seemed so far away? Now, we are almost living it. Also, I feel like Christmas happened way too fast. I need like, two more weeks of Christmas festivities. How did yours go? Marc actually ended up in the hospital for all of Christmas Eve and most of Christmas, so we were busy to say the least. (And yes, he’s totally ok!). Luckily, we both spent the 26th chilling in jammies, watching TV, and eating takeout. It was perfect, I just want to live every day like that. And now we are about to celebrate a whole new year!! Soooo let’s drink? 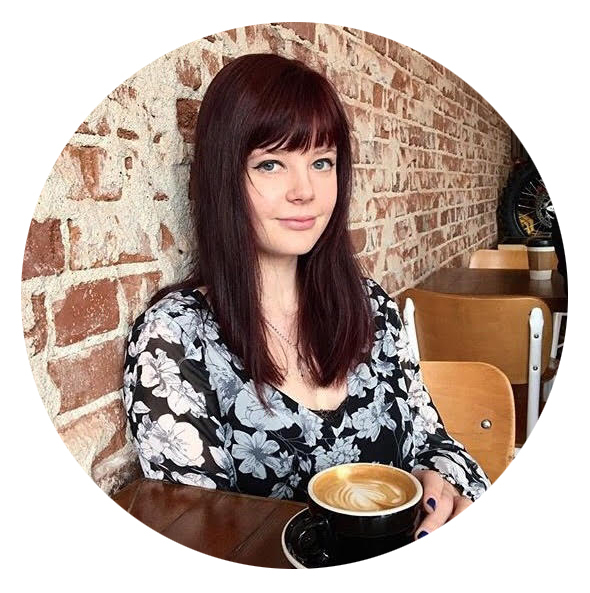 When it comes to my New Years drinks, I want them to be easy and boozy. And champagne should obviously be involved at some point. Usually I go out for New Years Eve, but of course, there are always a few parties to hit up, or we have a quick drink at home while we wait for our Lyft. And in those cases, you need a drink that can be thrown together even if you already have a few in your system. 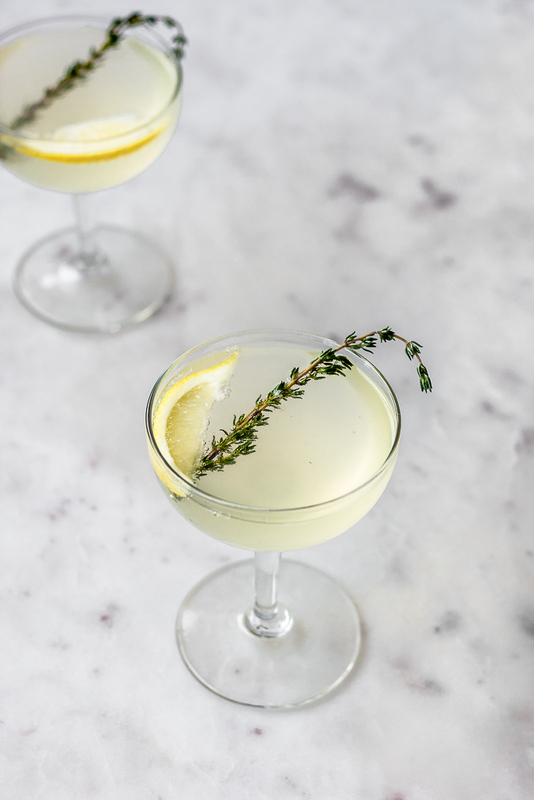 Enter the Thyme French 75. When I first learned about the French 75, I was totally iffy on the idea of gin with champagne. But guys, I was wrong. The floral taste of gin goes so well with fruity, dry champagne. I also threw in some thyme just because I love an herby bitterness to my cocktails. Also, I just have a thing for cocktails with a Gatsby aesthetic. 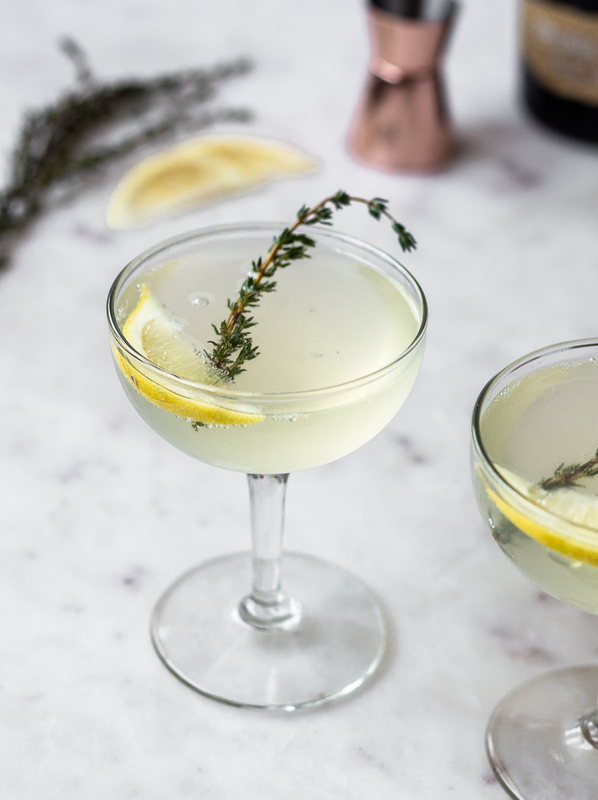 The thyme French 75 will make you feel fancy af, especially if you’re wearing glitter, trust me on this. 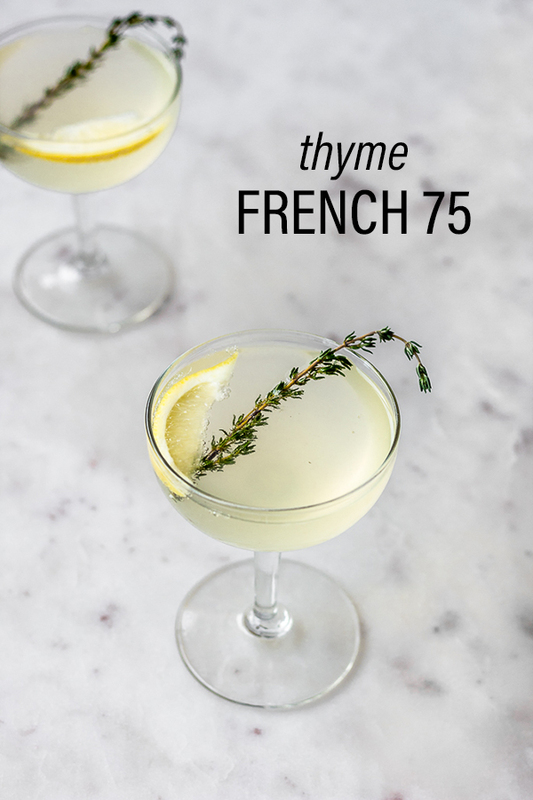 Tonight I will indulge in a couple of these thyme French 75 cocktails, and then we’re going downtown to watch the fireworks! I already have my perfect crushed velvet dress picked out. If the night goes well, I will probably end up eating an Awful Awful at The Nugget and then I will crash in sweatpants before 2 a.m. Which, tbh is saying something, because usually I can be found in bed by 11 on the weekends these days. Speaking of a New Year, I’ve been making resolutions like finally cleaning out my damn closet. (Why is cleaning closets so hard???). Also, I’m trying to think of new recipes to develop. According to my Insta top nine, apparently you all love desserts and vegetables? I’m v impressed at your flawless display of balance. But, of course, I do this all for you! Soooo, what do you want to see? Dessert? Weeknight meals? More cocktails? Feel free to comment below, or message me on Insta! 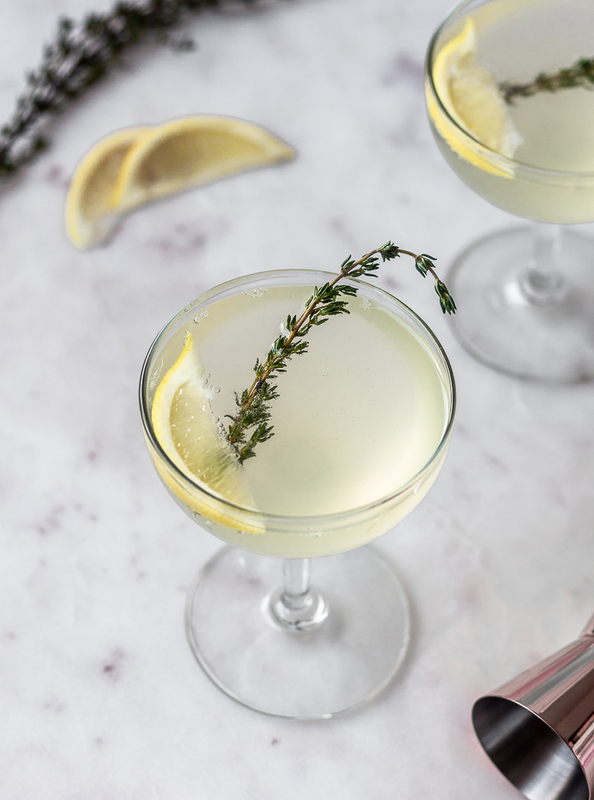 The thyme simple syrup in this French 75 perfectly compliments the floral notes from the gin and the fruitiness of the champagne. This is a fairly boozy cocktail, but you can use soda water or tonic in place of the champagne for a tamer drink. To make the thyme simple syrup, combine the sugar, water, and thyme in a small saucepan. Bring to a boil over medium-high heat, stirring until the sugar dissolves. Remove from heat, and let the thyme simple syrup infuse until it's completely cool. Remove and discard the thyme sprigs. Store in a jar in the fridge. In a cocktail shaker, combine the gin, simple syrup, and lemon juice. Add ice, and shake for about 30 seconds, or until the outside of the cocktail shaker is frosty. Strain into a champagne glass. Top with champagne, tonic, or soda water. Slap a sprig of thyme against the palm of your hand to release the oils. 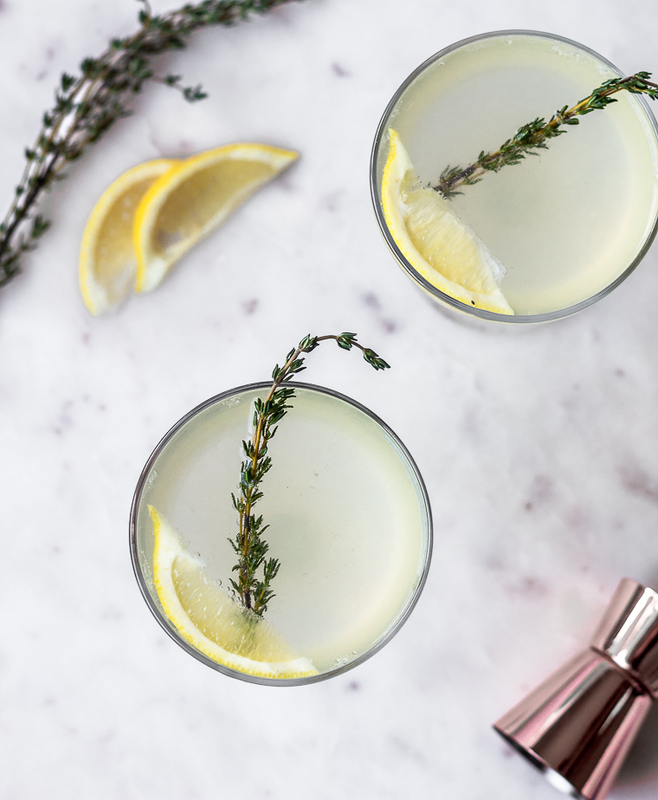 Garnish the cocktails with thyme and lemon wedges.